Do you remember the time that you were not connected to the internet? When you had to call your friend instead of sending a message via Whatsapp to make an appointment. The times you had to apply for a job by writing a letter with a pen instead of sending your Linkedin page? We all have gone through a major revolution in which we’ve all got a digital identity. The same revolution has started for things, right now! Things we use all day, like your watch or thermostat, get suddenly connected to the internet. These things are equipped with electronics, sensors and connectivity. Whether you like it or not, you will not escape this movement. According to Gartner there will be nearly 26 billion devices on the Internet of Things by 2020. The potential of the Internet of Things isn’t just linking millions of devices. It is more like the potential of Google or Amazon had when building massive IT infrastructure. The IoT is about transforming business models and enabling companies to sell products in entirely new and better ways. The definition of IoT is fairly simple. 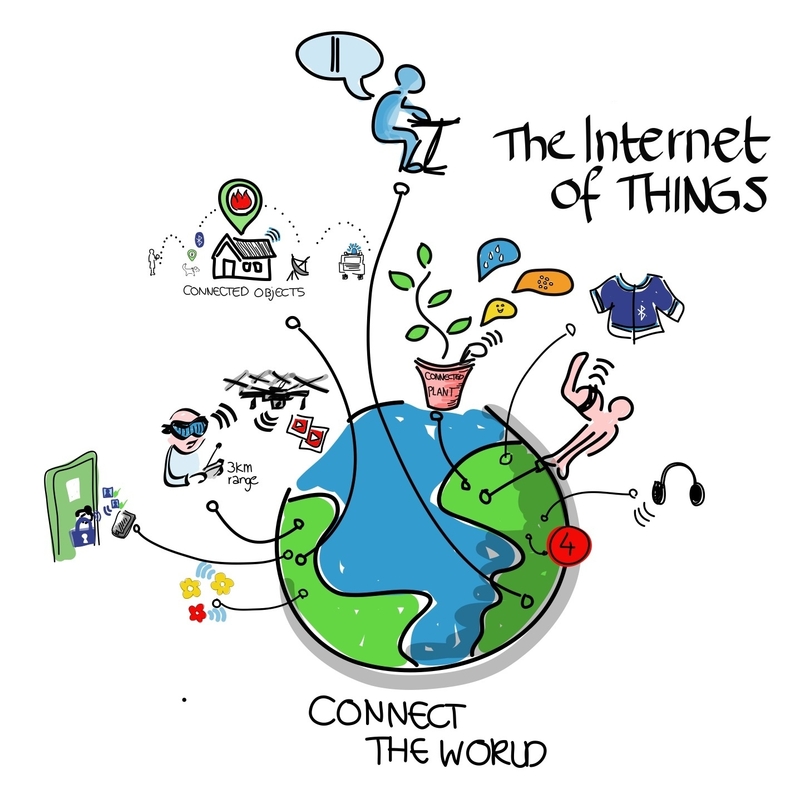 The internet of things involves every thing that is connected to the internet. You should exclude mobiles and computers, because they’ve already become mainstream. In fact, the Internet of things is a name for a set of trends. First of all we have the trend that objects, we use all day, are suddenly connected to the internet. For example bathroom scales that compares your weight with others. Another trend is that devices that were already shipped with CPUs have become much more powerful when they’re connected to a network. Functionality of the hardware depends on local computing as well as powerful cloud computing. Fitness tracker, can carry out some functionality, like basic data cleaning and tabulation, on local hardware, but it depends on sophisticated machine-learning algorithms on an ever improving cloud service to offer prescription and insight. Besides that we have the makers movement. Creating hardware isn’t for the big companies like Sony or Samsung anymore, just like creating software in the 80’s and 90’s was a privilege for IBM and Microsoft. Devices that are connected to the internet aren’t new. For many years, we’ve connected devices to the internet, although not at that size. I think we have to compare it concepts like ‘the cloud’. Before I heard the name ‘the cloud’ I was already using services that run on the internet, like Hotmail. But one swallow doesn’t make a summer. When suddenly lots of services are running on the web, we speak of a trend and the market will give it a name to it. The same is happening with the internet of things. Suddenly all kinds of ‘normal’ devices are connected to the internet and we have a movement towards that direction that is unstoppable. And the possibilities it will bring are endless. We can divide the internet of things into five smart categories. First of all we have the smart wearable. It is designed for a variety of purposes as well as for wear on a variety of parts of the body. Think of a bicycle helmet that detects a crash. Next to it we have the smart home. It’s goal is to make the experience of living at home more convenient and pleasant. A thermostat that learns what temperatures users like and builds a context-aware personalized schedule. A third and fourth category are the smart city and smart environment. It focuses on finding sustainable solutions to the growing problems. The last category is very interesting. It is the smart enterprise. One can think of real-time shipment tracking or smart metering solution that manages energy consumption at the individual appliance and machine level. There are plenty of new business models due to the internet of things. An example is a system that provides a sensor-embedded trash, so it’s capable of real-time context analysis and alerting the authorities when it is full and needs to be emptied. Another example is the insurance world, which will adopt the internet of things. There’s already behaviour-based car insurance pricing available. Customers who agree to install a monitoring device on their car’s diagnostic port, get a break on their insurance rates and pricing that varies according to usage and driving habits. Other disciplines in software development also have interest in the new movement, like big data. Internet of things will not generate big data, but obesitas data. Did you know that within every flight, there are 3 terabytes of data generated with all the sensors in an airplane? Think about how much data will be generated, that has to be analyzed, when all buildings in a town are equipped with sensors to measure the quality of the air? Challenging and good article! Compliments. The big ethical challenge will be that as an individual in general I like all smart solutions that have my best interest in ‘Mind’. Related to Rick’s comment about using the connectivity and data that are central to IoT in the user’s best interest: in my view, one of the fundamental aspects here will be the distinction between “passive Things” and “active/autonomous Things”. “Passive Things” are essentially networked sensors or data gathers, which rely on some external data-crunching entity to process the information they collect and turn it into (hopefully) useful action or information. The benefit of an external data cruncher is that it may not be possible to provide the “really valuable” insights without aggregating data from many sensors, and without using significant computing power that is not available on the Thing itself. On the other hand, relying on an external data processor puts the “data donor” at the mercy of that processor, who may indeed not be motivated or trusted to act in the donor’s best interests. The other category, active/autonomous Things, try to analyze their own data (and potentially data provided by other Things in their immediate vicinity, and belonging to the same owner) and make decisions on their own. Here, it may be easier to ensure that the data collected is really being used in the owner’s best interests, since the owner remains in control of where the data goes. On the other hand, the ability of such a comparatively small network (more a “LAN of Things” than an Internet ;-)) to make really useful decisions is limited by the lack of data and computing power available. Perhaps we will eventually see a move towards a middle ground, where the owner can choose to share as much data, and leverage as much external computing power, as desired..?